In the previous lesson you developed a composite control by assembling existing server controls. There is one more technique to add to the functionality of the existing controls. You can extend existing controls and add/customize functionality as per your requirement. This way you avail the core functionality of the base control to create a tailor-made control meeting your requirement. The designer features of Visual Studio such as smart tags and dialogs that are available for the base control continue to remain available for the derived control also. As an example I am going to take up a common scenario. You might be aware that features of the GridView control such as paging and sorting work in code less fashion if you use data source controls (ODS or SDS). However, when you bind raw data in the form of say a DataSet to the GridView it forces you to write event handlers for Sorting and PageIndexChanging events. In most of the cases code within these event handlers look very similar. To reduce this repetition you can create your own grid control that inherits from GridView base class. You can then add the logic for sorting and paging inside this custom control. Here, we created MyGridView class that inherits from GridView as its base class. This way all the functionality of GridView becomes available to our custom control class. The GetSortDirection() method returns the sort direction as SortDirection enumeration. The SortDirection enumeration is the same enumeration that GridView uses to represents its sorting direction. We persist the sort direction in a ViewState variable named _sortdirection. The possible values for this variable are ASC and DESC. Every time you cann GetSortDirection() method it returns existing direction to the caller and toggles the direction so that next time correct direction can be retirned. This is because if the grid is sorted in ascending order the first time then the next time we should sort it in descending order. The BindGrid() method accepts the sort expression (Column name) on which you want to sort the data. It then proceeds to create a DataView containing the required data. In above code we are fetching all the records from Employees table of Northwind database. The DataView is then sorted using its Sort property and the return value of GetSortDirection() method. We also persist the sort expression in a ViewState variable so that sorting and paging can co-exist properly. The base GridView is then bound with the DataView. The OnLoad() method simply binds the grid during first load (IsPostBack is false). The OnSorting() method calls the BindGrid() method by passing the appropriate sort expression. The OnPageIndexChanging method sets the current page index of the grid using the NewPageIndex property and rebinds the grid. In our example we have not provided any specific code inside OnSorted() and OnPageIndexChanged() methods but you can add it if you so wish. To use our MyGridView control on a web form, register it with the page using @Register directive. Also, create one instance of MyGridView in the form. 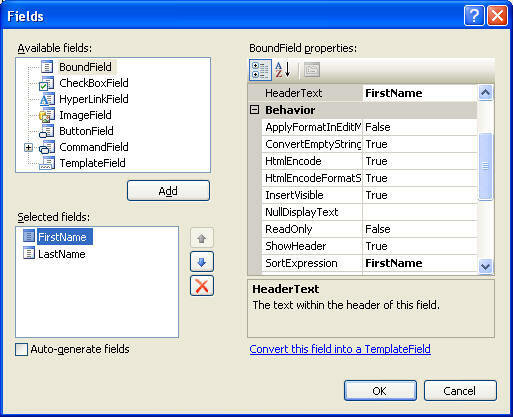 Using Visual Studio designer add two BoundFields to the MyGridView control. 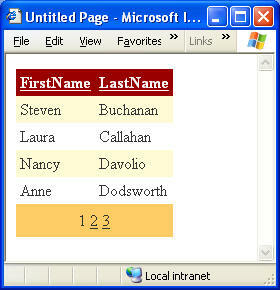 Bind the first BoundField with FirstName column and the second with LastName column. Make sure to set their SortExpression property to FirstName and LastName respectively. Set AllowPaging and AllowSorting properties of MyGridView to true. Try playing with sorting and paging functionality.